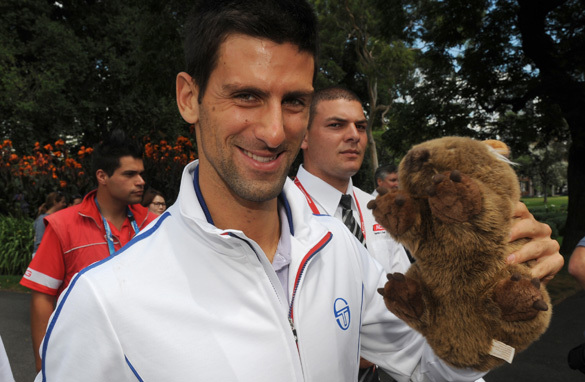 Novak Djokovic poses with a stuffed wombat the day after winning his third Australian Open title. The contrast between the men’s and women’s finals at the Australian Open could not have been greater. On Saturday, Victoria Azarenka thrashed Maria Sharapova to claim her first grand slam title and the No. 1 ranking. It was a result that suggested this year’s WTA season will be just as much as a free-for-all as 2011 was. On Sunday, however, Novak Djokovic won his third successive major title as he overcame Rafael Nadal in one of the most amazing finals in tennis history. We can debate until the cows come home about whether it was indeed the greatest, but it was definitely the longest. And what are the odds against the world No. 1 becoming the first man to hold all four grand slam titles since Rod Laver in 1969, when he goes to Nadal’s stronghold at Roland Garros in May? Roger Federer, who has the record of 16 major titles, could not do it in his prime. Twice he had the chance to hold non-calendar year slams, but the Swiss star was beaten by Nadal in the finals of the 2006 and 2007 French Opens. Nadal is by no means a spent force. He showed in Melbourne that he is closer to Djokovic than he was for most of last year, when he won a record-equaling sixth title in Paris after Federer ended the Serbian’s 43-match winning streak in the semifinals. And a quick survey of online bookmakers shows that he is still the favorite for Roland Garros, with Djokovic a close second despite having beaten Nadal in seven successive finals. Djokovic now plans to take time off as he focuses on a year that could see him win a “Golden Slam” – a feat previously only achieved by Steffi Graf, when she won the 1988 Olympic title. It would be a superhuman effort for him to emulate that, meaning he would have to – on top of ending Nadal’s French reign - triumph twice on the grass of Wimbledon before defending his U.S. Open crown in September. One man who will be determined to stop Djokovic when the fabled courts at SW19 host both Wimbledon and the 2012 London Olympics is Andy Murray, still Britain’s best chance of a first male grand slam winner since 1936. The Scot pushed his friend to five sets and almost five hours in the Melbourne semis – a far cry from his thrashing in last year’s final – as he made an encouraging start under the tutelage of eight-time grand slam winner Ivan Lendl. He showed far more aggression than usual, but crucial errors of the hair-tearing variety and an inability to hold his serve ultimately cost him victory. And what of Federer? He didn’t drop a set until he faced Nadal, when he was once again muscled off court by the 25-year-old, who seems to supercharge his game whenever they meet. It would be an unwise man who bets against Federer ever winning another slam, though I’d say he has more chance in a final against Djokovic than versus his great rival. Maria Sharapova must be wondering when her next major title will come. Twice in the past year the Russian has stormed into a final with great hopes, and twice she has come away empty-handed after a straight-sets crushing. It’s fantastic that she’s even contending for a fourth grand slam crown, given her severe shoulder problems in recent years, and she is clearly still massively popular – last week’s feature on her fashion business was by far the most-read sports story this year on CNN.com International. Azarenka has been threatening a breakthrough win for some time, but whether she will be still be No. 1 come the end of the French Open is anyone’s guess – that’s the nature of the women’s game at the moment. Last year three slams went to first-time winners, the only exception being Kim Clijsters. The Belgian failed to defend her Aussie title this month, losing to Azarenka in the semis. She has made it clear she is desperate to win her first French Open crown – having twice been a runner-up - before likely retiring for the second time at the end of this year. Wimbledon is also on the three-time U.S Open champion’s agenda, having reached the last four in 2003 and 2006. One player to complete a career slam at the weekend was Indian doubles specialist Leander Paes. The 38-year-old teamed up with Czech Radek Stepanek to win the men’s title on Saturday, with the unseeded pair upsetting American No. 1s Bob and Mike Bryan – who were bidding to win an Open era record 12th grand slam. Bob Bryan’s wife was due to give birth that day, but he revealed later that it didn’t happen as planned and he might get back home to Florida in time for the big moment. bravo novak, you are most dominant sport figure in the world. Sunday men's final was not only longest but also had all agony, anguish, beauty & cruelty of sport. Massive kudos to Djokovic, Nadal & chair umpire! It's Djokovic's 5th grand slam title and in fact it's first time he DEFENDS a slam. Personally I think defending a title is very much magnificent achievement because, after winning first one, you have to keep your strength for a year to retain it next year. Only Federer and Nadal could do that on slam among active men players. Thinking who can stop Djokovic Caesarism in slams, I remember a thing Federer had been said in his prime: The most formidable enemy is himself. After Nadal won Australian open 2009, people hardly doubted that he would triumph 5th straight RG to move forward to calender slam hope but after all injury hampered him. So I think the one who can stop Djokovic most is himself: injury/illness. Last autumn slump after winning US open showed it and unfortunately Djokovic has some allergies, one of those was said to have plagued him in Melbourne. He and team did great effort of discovering, conquering gluten allergy and if he keeps rude health, stopping the non-stop DJ Nole will be very difficult for anyone, maybe even if Rafael Nadal, 6th time & reigning Roland Garros champion. Glad that the supercharged Nadal has met his match! Bravo! Interesting thing is, that in many slam-finals, we can see a birds, seaguls, pidgeons etc, and, their featers falling on court.... (Wimbledone, US Open, and yesterday, at Aussie...). Conspiracy theory... hah. As a Serb, I want to say something else: Nadal was (and still is) great after all, after he lost match. Real respect for him – especially after 6 consecutive looses, yes, this is history, epic, and both players are part of it. And we're, luckily! Rafael Nadal can feel proud of all the support given with his worldwide fans... I am more than sure he is working harder to improve for any upcoming tournaments. What a brilliant match between two the greatest champions...and the level of tennis played by each respectfully could have resulted in either one of them winning. In this case Djokovic won because he was the greatest or perhaps it was simply that a modicum of luck favored him? ..and one last thought..too bad he isn't a more likable kind of guy...the Tarzan performance was just a bit too much not to mention completely inappropriate particularly in light of the quality of tennis played by his opponent...like I said either one of them could have won and Nadal almost did! Obviously it's unlikely that Djokovic will win all 4 slams and the Olympics but it's great for tennis that he at least has a realistic shot. What's also great is that we currently have 3 other men who can stop him doing so in Nadal, Federer, and Murray. In other eras we've had 2 guys maybe 3 at a stretch capable of winning a slam but in 2012 we have 4 legitimate contenders! Not only that, but each of them brings something different to the table. You've got the sheer physicality of Nadal, the elegance of Federer, the heart of Djokovic, and Murray the tortured artist. It makes men's tennis truly compelling right now. Roll on the French Open. Great show by Djokovic and Nadal. But don't count out Federer yet. Remember last US Open only a lucky flashy return of serve by Djokovic when facing two matchpoints and then a very lucky net chord of a powerful Federer forehand let the Serb through. But there is little doubt about it – Nadal has the wood on Federer for quite a while now. Its really like the truly great days of heavyweight boxing – the early 70s; when Frazier had Ali on the ropes and Ali had Foreman down and out and Foreman had Frazier out for the count. Its a great triumvirate right now with Murray and occasionally someone like Tsonga bouncing in and out. 2012 – mouthwatering!!! Novak, Nadal, Roger and Murray are playing wonderful tennis. Looking forward to the soon-to-come Grand Slams at Rolland Garros, Wimbledon and the US Open. Congrats to champion Novak and challenger Rafa. Well played. What an epic finals. Thanks. No doubt this is Djoko's prime time..and only time will tell how long or many more slams and majors he will win. Baring injuries/illness/ill-luck- this is simply djoko's time to dominate. Old Roger is not dead yet, the matador will surely come alive again-at least on clay courts, murray will suddenly eclipse djokovic.time, yes time is the only enemy? Good luck to all the champions and contenders in 2012. I think the only person who can beat Djokovic is Federer, It should go like this: Semi-Finals: Federer vs. Djokovic Nadal vs. Murray. Federer beats Djokovic, Nadal beats Murray. Then Nadal beats Federer, the only reason Djokovic beat Federer in the Australian Open is because he had a melt down. i expect djokovic to remain the dominant force for a few years now, he's at the right age. federer (and to a lesser extent nadal) have been incredible, but now it is djokovic's time.